NASH is usually first suspected in a person who is found to have elevations in liver tests that are included in routine blood test panels, such as alanine aminotransferase (ALT) or aspartate aminotransferase (AST). 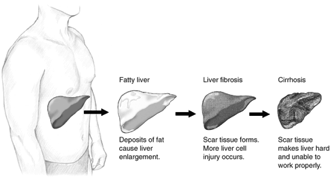 When further evaluation shows no apparent reason for liver disease (such as medications, viral hepatitis, or excessive use of alcohol) and when x rays or imaging studies of the liver show fat, NASH is suspected. 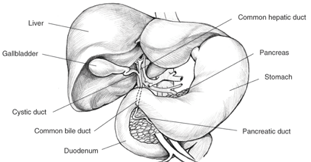 The only means of proving a diagnosis of NASH and separating it from simple fatty liver is a liver biopsy. For a liver biopsy, a needle is inserted through the skin to remove a small piece of the liver. NASH is diagnosed when examination of the tissue with a microscope shows fat along with inflammation and damage to liver cells. If the tissue shows fat without inflammation and damage, simple fatty liver or NAFLD is diagnosed. An important piece of information learned from the biopsy is whether scar tissue has developed in the liver. Currently, no blood tests or scans can reliably provide this information. A major attempt should be made to lower body weight into the healthy range. Weight loss can improve liver tests in patients with NASH and may reverse the disease to some extent. Research at present is focusing on how much weight loss improves the liver in patients with NASH and whether this improvement lasts over a period of time. People with NASH often have other medical conditions, such as diabetes, high blood pressure, or elevated cholesterol. These conditions should be treated with medication and adequately controlled; having NASH or elevated liver enzymes should not lead people to avoid treating these other conditions. Another experimental approach to treating NASH is the use of newer antidiabetic medications—even in persons without diabetes. Most patients with NASH have insulin resistance, meaning that the insulin normally present in the bloodstream is less effective for them in controlling blood glucose and fatty acids in the blood than it is for people who do not have NASH. The newer antidiabetic medications make the body more sensitive to insulin and may help reduce liver injury in patients with NASH. Studies of these medications—including metformin, rosiglitazone, and pioglitazone—are being sponsored by the National Institutes of Health and should answer the question of whether these medications are beneficial in NASH. Nonalcoholic steatohepatitis (NASH) is fat in the liver, with inflammation and damage. No specific therapies for NASH exist. Experimental therapies being studied include antioxidants and antidiabetes medications.